Thanks to movies and TV, Southern California is full of faces and places you’ll recognize, and Terranea Resort is one of them. It’s kind of a big deal, but unlike the rest of Los Angeles county, Terranea doesn’t gloat. The hotel’s cove was featured in films like Pirates of the Caribbean and Charlie’s Angels. The rooms and pool made cameos in This is 40 and the property was the backdrop for The O.C.’s theme song. Then there’s the cave, which was used as Batman’s home base in the TV show (pre-Terranea). The secluded resort has also attracted the likes of Britney Spears and Mariah Carey. But you won’t find this out unless you ask. Much like its setting, the hotel’s personality (because hotel’s can totally have personalities) is humble and refined. 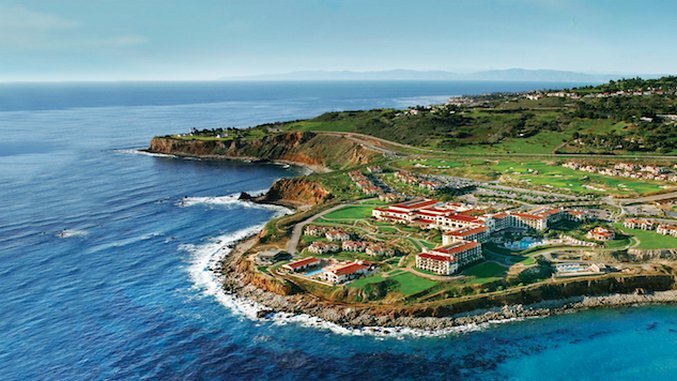 Only 30 miles from downtown Los Angeles, Terranea Resort, spread over cliffs looking out on the Pacific Ocean and Catalina Island, seems much farther. First impressions are everything, and Terranea, a Destination Hotel, sets the bar high with a sparkling and spacious courtyard. Guests are greeted by a large driveway with a fountain in the center and different types of trees lining the sides. Arriving at night is extra special as the area twinkles thanks to strung lights. While it’s definitely much nicer than most residential driveways, the low branches and lights give the courtyard a romantic and friendly feel. With huge windows facing the ocean in front of you, and a high wood ceiling and glass chandelier above, a warm but not stifling feeling permeates the lobby’s spacious halls, setting the tone for the rest of your stay, during which you’ll have to force yourself to get out of the plush bed to explore the property. Chances are you’ll have a bit of a hike to your room, as the estate is spread out over 102-acres, and with every step, the anticipation builds. Unless you’re staying in a villa, bungalow or casita—which are housed separately—you’ll follow a carpeted hallway from the lobby past local art, the lobby bar, and little shops to your guest room. As you open the door, your eyes will immediately fly to the wall of windows overlooking the ocean. Also on that wall is the door to your private balcony. The rooms channel the beach with sandy tones, from the armchair to the curtains, and beechwood furnishings, from the night stand to the headboard. When checking out the bathroom, you’ll probably panic briefly unable to find the toilet. Don’t worry, they didn’t forget it. Check behind door No. 3, where it waits tidily, because no one wants to look at a toilet all day. The L’Occitane products remind you that you’re at a luxury retreat, while the teal walls and tiling and shell-embossed sconces bring you back to the beach. Good luck forcing yourself out of the bed that seems to be topped with a layer of fluffy feathers, although the view of the ocean is worth getting up for. The rooms range in size from 450 sq. ft. to 1,800 sq. ft., and the largest multi-bedroom villa is 2,800 sq. ft.
As mentioned, Terranea sits on 102 acres of land, and the buildings occupy only a third of that space, leaving about 75 acres of natural landscape. They’ve used the leftovers to build hiking and bird watching trails (they have falcons, owls and hawks on the property), a man-made beach next to the famed cave, and four pools. What’s really impressive, however, is the way the setting is integrated into the entire experience. The spa offers scrubs using sea salt collected from their cove. They use that very same salt (well, not the stuff that was on your body) at the restaurants, which use produce from the farm they have just up the road. Many of the fitness classes take place outside, and they have guides on-site to take you on an educational stroll. While they could just plop you in front of an open window presenting the copper cliffs and aquamarine ocean and that would be enough, Terranea makes the effort to help you experience the surroundings they call home. They know they’ve hit the jackpot with this diverse landscape, and they don’t take it for granted. Nor do they let guests. With multiple boutiques, eight restaurants, a fitness center, a spa, and the Pointe Discovery center (which will plan any activity you desire, from kayaking to snorkeling, or both—which they call kayorkling), there’s not much of a reason to leave the property. However, if you must, Hollywood is 37 miles away, Long Beach is 15, and there are plenty of coves to be discovered along the Palos Verdes Peninsula. Maggie Parker is the assistant travel editor at Paste Magazine.